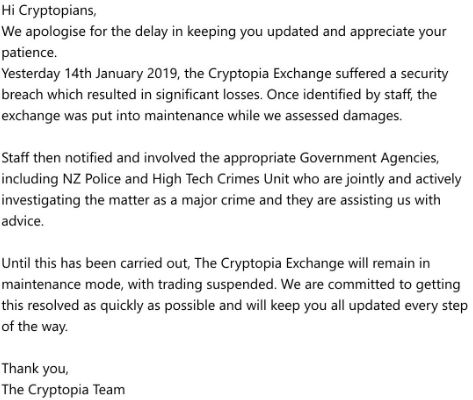 New Zealand cryptocurrency exchange Cryptopia has announced following 24 hours of downtime, that the exchange has been hacked. Cryptopia had been down for roughly 24 hours since 14 January 10:00 UTC, announcing that the website was experiencing unscheduled maintenance. The red flags starting waving a day later with the exchange still down. The exchange has since announced that a security breach occured which resulted in significant losses. No futher information has been given at this time. However Cryptopia announced that they are currently dealing with government agencies in an attempt to assist in the matter. Cryptopia have also stated that the exchange will remain in maintanance mode till further notice. Trading has been suspended. Stay tuned here on Chepicap for more information on the Cryptopia hack.